There’s a reason Volvo is known for its safety. After all, this luxury large sedan has garnered the top rating from IIHS since 2007, and that didn’t change in 2014. Another top safety pick, the Volvo S80 performed well in all crash tests and also got the highest rating for rear crash protection and head restraints. 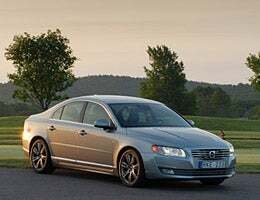 In addition to holding its own in crashes, the Volvo S80 offers a host of safety features — some standard and others that can be added to help avoid accidents. Included are active high beams, which recognize the headlight beam of oncoming vehicles and automatically shifts between high and low beams; an adaptive brake light that can tell the difference between panic and normal braking; and collision warning and lane-departure warning. The Volvo also offers safety technology, which is designed to prevent accidents at low speeds by applying the brakes automatically if a crash is imminent. Pedestrians don’t have to worry about getting hit, thanks to the pedestrian detection with full auto braking. This entry was posted in New Volvos and tagged car, Fun Buying Cars, Have Fun, MA, new cars, other brand pre-owned, S80, Safety, snow storm, Volvo, Wellesley. Bookmark the permalink.